The Small & Medium Enterprises (SME) sector is a major thrust area of NMB Bank. We are continually working towards increasing our SME base and creating a loan portfolio with a major SME contingent in it. As part of the Global Alliance for Banking on Values (GABV) we strive towards value-based banking products with an aim towards sustainable banking resulting in resilient communities and economies. The SME division of NMB bank caters to the following loan segments. Small & Medium Enterprises: SME lending is customized for customers with loan requirements ranging from NPR 5 Million to NPR 50 Million. Our targeted sectors in SME lending include trading, manufacturing and service sectors. Within these sectors we have identified potentials such as tourism related businesses viz. hotels and resorts, export-based manufacturing such as handicraft, apparel and carpets, and businesses which produce goods for local trading as our specific focus areas. Our aim is to help larger SMEs grow into business houses that are household names. The growth of our national economy is intrinsically linked with growth of the SME sector and our aim is to be a prominent part of this national economic phenomenon. Micro SMEs: MSME loans products are specifically designed for smaller business customers with loan requirements ranging from NPR 1 Million to NPR 5 Million. We understand the small family run businesses have specific requirements, and our MSME products are designed to service small businesses in sectors of trading, manufacturing and service. 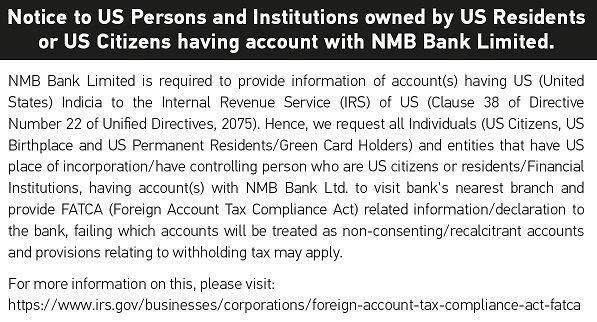 We at NMB SME division understand the issues small businesses face with preparation of financial documents, conforming to tax requirements and understanding the requirements of their financial partners. We are continually working to improve our advisory services and increase the number of outlets and channels to provide these services so that we can assist businesses in each step of their business building process. We endeavor to assist them in each step from document preparation to advising on tax regulations while constantly working to make our process simpler, so that they can focus on what is most important to them i.e. their business. Agriculture Lending: To ensure that our financing reaches all demographics in society and to live up to our values of putting people, prosperity and planet first, Agriculture lending is one of our priorities. Agriculture is the primary economic activity of our country and yet lack of access to finance across the supply chain in agricultural activities has hindered optimal production and benefit from this sector. 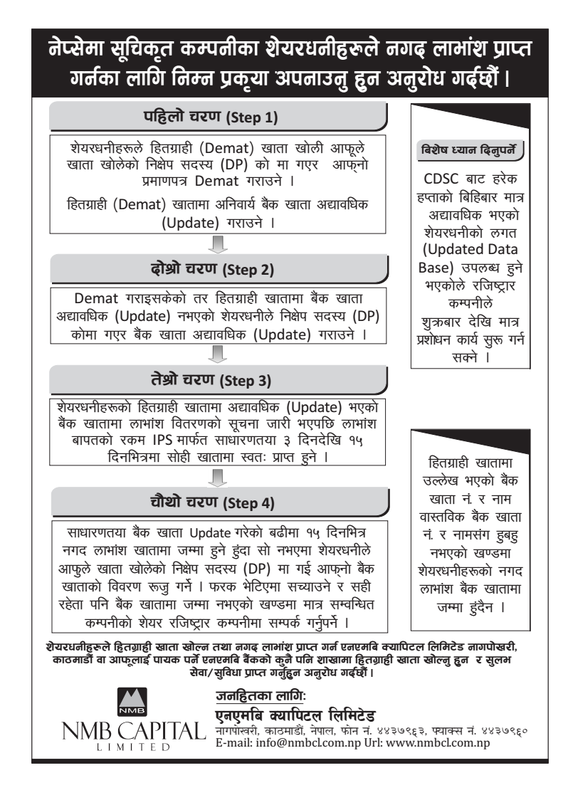 In addition to supporting the initiative of Nepal Rastra Bank to increase financing in agriculture sector, we have been and remain committed to providing support to the agricultural sector by our direct and indirect activities. Further to directly financing agriculture related businesses, we are continually seeking out partners to provide non-financial expertise and knowledge, so we can create programs and procedures to support small farms and farmers, while at the same time remaining vigilant to fill the financing gaps in the value chain. Our focus on your needs is reflected at every level of our organization. Our enthusiastic staff at our branches across the country will delight you with their understanding of your business and their eagerness in providing our services. 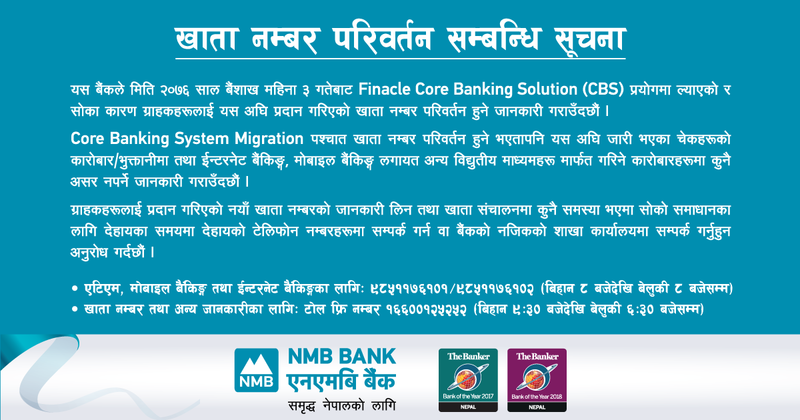 NMB Bank looks forward to welcoming you and your business at our service outlets.